a peek inside the fish bowl. blog of andrea tomkins. Welcome to andrea's blog. Here for no reason in particular. May or may not be here tomorrow. > Cat scan. I'm not kidding. > The Stress Relief Aquarium. Five minutes of fun. I can relate most to the "jostle" effect. > Tick Tock Toys archives. Kids food packaging from way back. 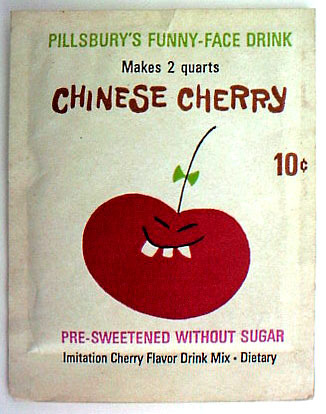 Some of it not very politically correct; like Chinese Cherry drink mix from Pillsbury. 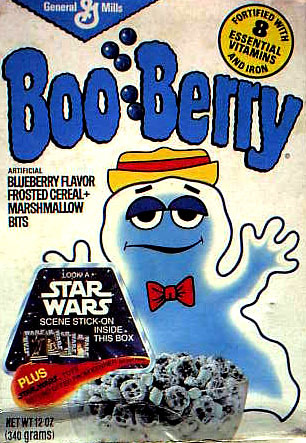 I also found my favourite childhood cereal, Boo Berry! "I feel my former life pulling at me like a choke chain as I consider the banality of my days, my options. I received a pile of forwarded mail this morning, invitations to openings and shows, a stack of unpleasant reviews from a clipping service. I think of my old apartment on Toronto's College Street, of sitting in its cramped living room, sketching late into the night while one of the degenerates lay comatose beside me. I compare this image with another: Troy and I last night, sitting on our immense beige leather couch, watching a dvd of Saving Private Ryan. Troy dashing away tears and stating, "Ted Danson should get more work" with a ferocity that startled and embarrassed me. I realize I am losing myself here." > The Blind Assassin, by Margaret Atwood. > a candy-scented massage bar from LUSH. Good for daily tummy-rubs.